To alleviate your holiday season stress, you should consider visiting MJ Crafts Design Studios Holiday-Seasonal Crafts Gallery page--where you will find a sampling of all the unusual and interesting handmade crafts created for specific holidays in the year. You will find handmade crafts for New Year's Eve, St. Valentines Day, St Patrick's Day, Easter, Secretary's Day, Mother's Day, Father's Day, 4th of July (1), 4th of July (2), School-Teacher, Halloween (1), Thanksgiving, Christmas (1), and Christmas (2). Take your time and visit them now, so you can start planning ahead and do your shopping the easy way...online with MJ Crafts Design Studio!!! MJ Crafts Design Studio-Handmade crafts and gifts; Home of the Eggypiece Art Collection, beautiful and funny FIMO Polymer Clay creations, and many more 100% handmade crafts made out of ceramics, porcelain, wire, beads, and polymer clay. Very unusual! PayPal and Family Friendly. Some of the interesting things about MJ Crafts Design Studio, is the artist's ability to create fun and unique handmade crafts. If you are ready for some fun, check out the FIMO Polymer Clay Crafts Page 1, and Page 2. There are a lot of funny-looking crafts for children, adults, and specially for the "young-at-heart" adult. There are seven major collections where you can go from these pages, which are: Bookmarks and Paper Clips, Seasonal Snail Craft Collection Page 1 and 2 , Snail Pin Collection, Snail Craft Collection, Jewelry Collection Page 1, and 2, Under the Sea "Fishy" Collection, and the "Mommy" Pins or Paper Weight Collection. By the way, the Jewelry Collection is sub-divided into Pins, Women Watches, Necklaces and Earrings Sets, and Bracelets. These are just some of the handmade crafts you will find at MJ Crafts Design Studio...handmade crafts for all seasons and occasions! Description: Handmade with glazed Fimo. Nickel and silver wire are used for final details. Pins are embellished with Austrian crystals. Description: Handmade with glazed Fimo. Nickel and silver wire are used for final details.Pins are embellished with Austrian crystals. Also, make sure you visit our Resources Directory, and the Additional Links Resources Directory. Lots of great listings and information at both of them. Animal & Garden Bookmarks - Dimensions: About 2- 4"hDescription: Handmade of glazed Fimo. Nickel wire is used for final details. You can use them as bookmarks or paper clips.Different, fun and functional! Unique designs for any taste!More designs will be available soon! By the way, these, and all the other bookmarks are shipped in a beautiful acetate clear pillow box. The color of the foam leaf may vary according with the bookmark colors. Animal "Home & Garden" Bookmarks - Dimensions: About 2- 4"hDescription: Handmade of glazed Fimo. Nickel wire is used for final details. You can use them as bookmarks or paper clips.Different, fun and functional! Unique designs for any taste!More designs will be available soon! Animal & Jungle" Bookmarks - Dimensions: About 2- 4"hDescription: Handmade of glazed Fimo. Nickel wire is used for final details. You can use them as bookmarks or paper clips.Different, fun and functional! Unique designs for any taste!More designs will be available soon! "Bugs" Bookmarks - Dimensions: About 2- 4"hDescription: Handmade of glazed Fimo. Nickel wire is used for final details. You can use them as bookmarks or paper clips.Different, fun and functional! Unique designs for any taste!More designs will be available soon! "Celestial & Tender" Bookmarks - Dimensions: About 2- 4"hDescription: Handmade of glazed Fimo. Nickel wire is used for final details. You can use them as bookmarks or paper clips.Different, fun and functional! Unique designs for any taste!More designs will be available soon! Description: Handmade of glazed Fimo.Nickel wire is used for final details. You can use them as bookmarks or paper clips.Different, fun and functional! Unique designs for any taste!More designs will be available soon! "Night Glow" Bookmarks - Dimensions: About 3-4.5"hDescription: Handmade of glazed Fimo. Nickel wire is used for final details. Glass and pewter beads are used to embellish every bookmark. Accentuated with Austrian crystals. Unique designs!More designs will be available soon! "Sky & Garden" Bookmarks - Dimensions: About 2- 4"hDescription: Handmade of glazed Fimo. Nickel wire is used for final details. You can use them as bookmarks or paper clips.Different, fun and functional! Unique designs for any taste!More designs will be available soon! 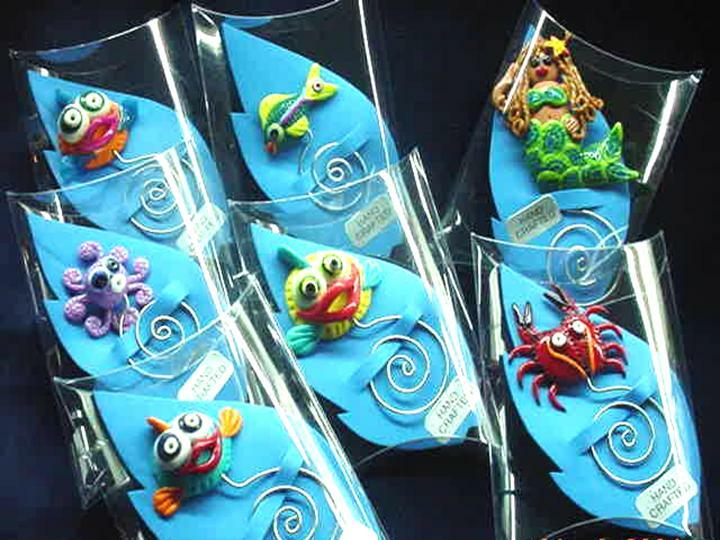 "Under the Sea" Bookmarks - Dimensions: About 2- 4"hDescription: Handmade of glazed Fimo. Nickel wire is used for final details. You can use them as bookmarks or paper clips.Different, fun and functional! Unique designs for any taste!More designs will be available soon! "Whimsical Happy Sun" Bookmark - Dimensions: About 5"hDescription: Handmade of glazed Fimo. Gold plated findings and wire are used for final details. Different, fun and functional! Unique designs for any taste! More designs will be available soon! If you prefer, you may visit the Bookmarks Collection Page which will have photos of all the collections together. Thanks for your attention, and until next time...the Eggypiece! The exhition of the Eggypiece Art Collection (porcelain and ceramic decorated eggs) at the U.S. Embassy, Montevideo from 28 June- 9 July was a resounding success. 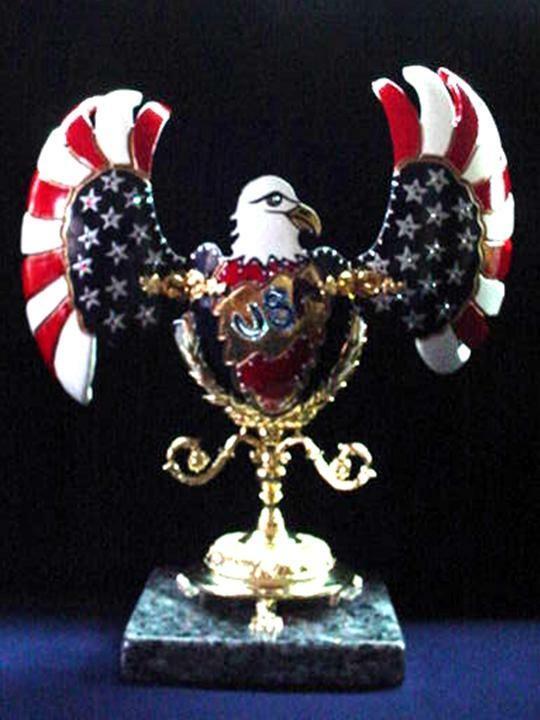 The "Soaring Eagle" Eggypiece was the center of attention at this exhbition in commemoration of the the Independence Day celebration at this overseas post. Besides the Eggypiece exhibition, Mary was invited to sell her handmade crafts to the embassy's employees for a couple of hours at the Community Liaison Office Lounge Area. Hi! My name is Jose, husband of the artist Mary and webmaster of MJ Crafts Design Studio. You may have seen my photo in the “About Us” section, and possibly read my bio. I ask for your indulgence and a few minutes of your time so that I can explain to you our philosophy on “customer-service." First and foremost, let me explain that my wife, Mary, is a consummated businesswoman who has owned and managed two flower shops at U.S. military installations. Her loyal customers where always disappointed when they found out she was closing shop because the military was moving us again. Now, you may ask…why didn’t you keep the shop open and have an employee manage it? Well…we tried that the first time around for about a year; however, the customer base dropped to a point in which it was no longer economically feasible to maintain the store. Her customers would be writing and calling her every week telling her how much they missed her, and her “special touch”. Furthermore, the customers missed her customer-oriented attitude. Mary would work with the customer to customize floral arrangements, gifts, or personalized creations to match and satisfy the customer’s needs. No cookie-cutter approach! Every gift purchased from her store was intended for a specific purpose. Of course, I’m not saying that it was like this for every single person that walked into her store…I’m talking about her loyal, repeated customers, which were many. One person who was very disappointed to see Mary leave her last flower shop was the Army Post Commander’s wife…this was at Fort Buchanan, Puerto Rico. This lady was a loyal customer of Mary’s creations and told her how much she would miss her creations. The Post Commander, awarded Mary with a beautiful letter of recommendation and an “Excellence Service” award. Now, lets talk about me, as the other half of this team. I have been browsing the net considerably during these past months…mainly to learn how to maintain a website, as I'm not a professional webmaster. I’ve noticed that many sites post multiple logos from third-party companies as a testimony to their potential customer that their company is a reliable business and that they will fulfil their end of the bargain.Well...I have to tell you, that for now you will not see one of those logos in this site. Why?…for starters, I don’t feel the need to pay hundreds of dollars to some company so they can testify that I am an honest businessman. I believe a person’s word is his/her bond and that should suffice. I was raised in my family with that principle, and it was further ingrained in my personality by my almost 24-year career as an officer in the United States Air Force.The Internet may be huge, but the handmade crafts section is a manageable, small enough sector where customers will probably find out if a business is legitimate and willing to provide adequate customer service. Now, I’m a flexible person and will continue to learn more about the website business…and who knows, I may change my mind if convinced otherwise…but for now, you have our words that if you are not satisfied with your MJ Crafts Design Studio creation, we will work with you, or return your money if that is the what it takes to maintain you as a customer, and you have OUR WORD on it!